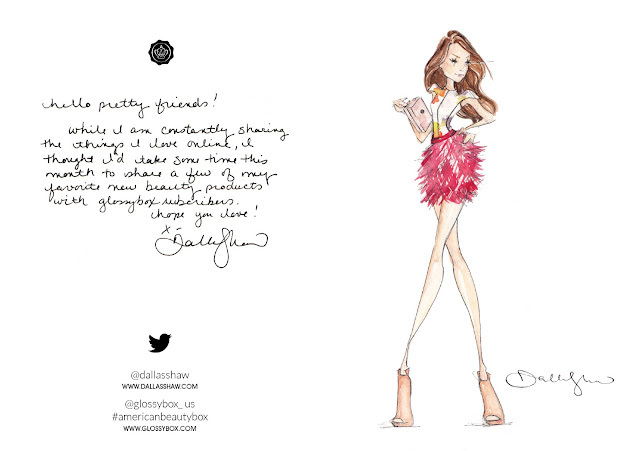 As you know I have been working with the team at Glossybox since March on the American Beauty Box! I've been dying to share it with you and I'm proud to say that I can finally show it off. I redesigned the standard pink box this month. Turned it white and added a fashion illustration on top! What I hear most from readers and followers is that they want a piece of the artwork and cannot afford the hefty price tag ( I see you) . SOOOO I am excited to say that this is one of the rare occasions that we have printed the work to get it into your hands. Hope you'll display it in your most stylish space. And, as per usual, I want to see a picture when you do. Tweet it at me @dallasshaw!!! You can order now through end of June, so if you haven't gotten yours yet go go go! I would like to share a small change in the collaboration with my followers, fans and friends. When the nail company we originally planned to include defaulted on their plan to provide the polish, we decided to replace it with a different product on my love list (one that has also been personally chosen by me and which I feel confident that you’ll enjoy). I apologize for any confusion this caused subscribers and I thank you for the amazing faith you always placed in me and my brand. Congratulations on a super fabulous collaboration! I wish I was back in NYC to order a box! I would seriously just keep it for your illustration! I can't wait to get mine!! IT'S SO GOOD!!!!! It can't get in my hands fast enough. Like seriously. Congratulations this is wonderful news and the box looks A-Mazing! Love Love Love it. Hi Dallas, we're getting the Oscar De la Renta perfume in full size? What scent please?